The benefits and the medicinal values of Kalonji are known to the world since the ancient times. Kalonji is an ayurvedic herb and known for its powerful curing and healing aspects. Prophet Hazrat Muhammad (S.A.W.) said that Kalonji is the remedy for all diseases except Death. Due to its surprising protective and healing powers, Kalonji oil is regarded as ‘Miracle Cure’. Therapeutically, Kalonji oil is used as anti-histamine, anti-pyretic, anti-helmintic, anti-spasmodic, anti-inflammatory, anti-tumour, anti-bacterial and antioxidants. Kalonji is an ayurvedic herb, producing blue flowers and black seeds, which are helpful in extracting Kalonji oil. The half meter bush is, in fact, originated in Turkey and Italy. Kalonji black seeds are being eaten for centuries in the Gulf countries, India, Pakistan and Bangladesh. It is abundantly found in these areas. Kalonji oil is used in food in many parts of the world, especially the Middle-East. The plant is given more importance in the Middle-East and Muslim world as Prophet Hazrat Muhammad (S.A.W.) said that Kalonji, the black granules is the remedy for all diseases except death, according to Hazrat Abu Hurerah (R. A). 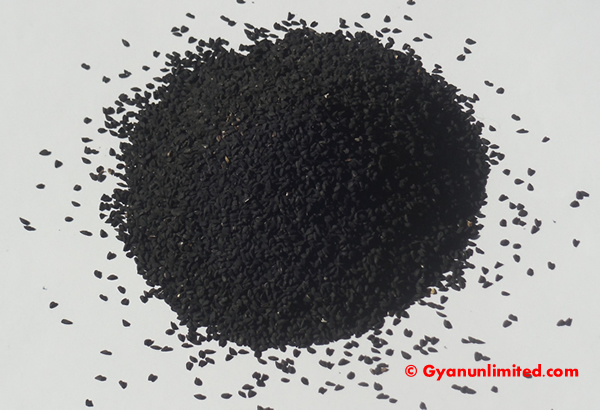 Kalonji are small black seeds, also known as nigella seeds. There are very few ayurvedic herbs which are as important as Kalonji black cumin oil. The black seeds of Kalonji have more than 100 medicinal components. Medically, Kalonji is used as antiseptic and beneficial for many diseases like blood sugar, blood pressure and body weight. Since, it helps to cure many diseases and disorders and helps in developing the resistance of the body, therefore, Nigella seeds are termed as excellent healer. Kalonji therapeutic aspects first came into lime light when Prophet Muhammad (Sallallhu Alaiyhi Wassallam) narrated its therapeutic benefits and its in-depth potential of diseases curability. The seeds of Nigella sativa have many chemical compositions. Nutritionally, Kalonji oil is having many minerals and important nutrients. The black seeds are rich source of calcium, iron, sodium and potassium. This black seed oil has high nutritional value containing dietary fiber in the form of monosaccharides and non-starch polysaccharides. Monosaccharides are found in Kalonji as glucose, rhamnose, xylose, and arabinose. Kalonji is abundant in fatty acid, especially the essential fatty acid and unsaturated one. Total 15 amino acids, which are the building blocks of protein, are found in the black seeds. Arginine and carotene are good for infant growth and vitamin A formation respectively. The health benefits of Kalonji oil are unlimited. Kalonji oil has been used as miracle cure for a number of diseases and disorders. The black seeds oil is unparallel in its efficiency to cure health ailments. Pure Kalonji black cumin oil, which is extracted from Nigella seeds, is used as a component in the preparation of many medicines. The black seed oil is helpful in maintaining health and develop resistance of the body, thus save the body from different infections. It has been the part of more than 200 modern medicine researches. Nigella sativa oil is unique and has the ability to cure many health ailments. Kalonji oil in combination with other ayurvedic herbs is useful in the treatment of many diseases. Here is the list of diseases where Kalonji play a pivotal role in their management and treatment. The different diseases for which Kalonji are beneficial: Hypertension, Diabetes, Cough, Asthma, Heart Attack, Cancer, Ladies Diseases, Skin Diseases, Headache, Backache, Toothache, Stomach Pain, Allergy, Polio, Paralysis, Arthritis, Eye Diseases, Memory Power, Kidney Pain, Blood Pressure, Piles, Hair Loss, Skin Diseases, Constipation, Stomach Worms, Jaundice, Dandruff, Psoriasis, Burning Sensation, Obesity, etc. Kalonji oil for hair is an important home remedy to make hair smooth and stronger. However, many people don’t know how to use Kalonji oil on hair. Kalonji oil cures baldness. Rub Kalonji oil on the head twice a day, which is helpful to prevent baldness. Baldness can also be prevented when a mixture of coffee (one cup) is taken along with Kalonji oil (1/2 spoon) twice a day. Rub your hair with lime juice, leave it for 15 minutes. Now, wash it with shampoo and use Kalonji oil when hair gets dry. Following the procedure for one week will help you to prevent premature falling of hair. Heat the mix of Kalonji oil (10 grams), Olive oil (30 grams) and Mehandi powder (30 grams) for few minutes till it converted into paste. Apply the paste over your head and wash it. The method is helpful to get rid of dandruff. Kalonji oil is good in the treatment of headache. To cure migraine, it is suggested to instil Kalonji oil (one drop) in the opposite nasal area of the headache. It is useful to cure half sided headache. To relieve from headache, massage with Kalonji oil is also effective. It is also suggested that Kalonji treatment is helpful in getting rid of migraine when 10 drops of Kalonji oil is taken once a day. Rubbing of Kalonji oil on the forehead and near ears are beneficial to headache. Drinking of Kalonji black cumin oil half tea spoon twice a day is good to overcome migraine. Kalonji can be used as herbal beauty tips at home. The mix of olive oil (1 tsp) and Kalonji oil (1/2 tsp) rubs on the face, left it for an hour and wash it with shampoo. Continue it for a week. This is one of the fine beauty tips for face. Take a cup of orange juice and mix Kalonji oil (1/2 tsp) twice a day, generally in the morning and before going to bed. One can observe the beauty benefits of kalonji oil after four weeks. It is beneficial against pimples, red granules and blackheads. The mix of Sunheri gearu (10 gms) and few drops of Kalonji oil, applied on the face at night and wash it in the morning. This tips helps in glowing of skin. Make a mixture of olive oil and kalonji oil (50 gms of each). Drink half spoon of the same in the morning before breakfast. The combination is helpful as an herbal skin care tips. Take the mix of honey (2tsp) + Kalonji oil (1/2 tsp) + olive oil (1/2 tsp). Mix all the ingredients properly. Use it twice a day-once in the morning and secondly in the evening and continue for one months. It is helpful in skin care and skin smooth. The application of kalonji oil and vinegar is good to control skin diseases. It should be applied before going to bed. Kalonji oil is helpful in stomach ache of children. Children can be given the mix of Kalonji oil (2 drops) and mother or cow’s milk in case the child experiencing stomach pain. Take the mix of Kalonji oil (1/2 tsp) and milk (1 cup) twice a day, it helps to give relief from chest irritation and stomach related problems. The combination of ginger juice (1 tsp) and Kalonji oil (1/2 tsp) when drink twice a day, eases indigestion, stomach irritation and stomach ache. Digestion of food will enhance when the mix of Kalonji oil (1/2 tsp), Vinegar (1/2 tsp) and Sugar (1tsp) are taken twice a day in the evening and morning. It should continue for 10 days. The mix of Honey (200 gm) and Kalonji oil (1/2 tsp) when uses in the morning and evening, is helpful in diseases of liver and abdomen. Take Vinegar (1/2 tsp) and Kalonji Oil (1/2 tsp), the ingredients are useful in overcoming the problems of round worm and tape worm in the stomach. Kalonji oil is very effective at treating of dental problems and dental diseases. To get relief from tooth pain and teeth soreness, Kalonji oil can be rubbed at the affected part. Continue the after 15 seconds. Gargling Black seed oil (1/2 tsp) mix with water helps to solve teeth problems. Dental problems such as premature fall of teeth, teeth weakening, bleeding from teeth, bad smell, etc. it is advisable to take the mix of Kalonji oil (1/2 tsp) and 1 cup of curd twice a day. Dental problems can be sorted out when Kalonji oil soaked cotton is put on the affected area and remove it after 15-20 minutes. It may be continued foe seven days to solve teeth problems. The combination of vinegar (1 tsp) and Kalonji oil (1/2 tsp) when applied on the affected area for two to three minutes and rinsed the mouth. It is teeth caring and helpful in removing of teeth pain. Kalonji alone or in combination with other herbs are beneficial for pain relief. The mix of vinegar (1tsp), honey (2 tsp) and kalonji oil (1/2 tsp) when taken twice a day is helpful in pain management. The massage with black seeds oil is helpful for relieving the effects of arthritis. Eating two pieces of dry fig along with 4 drops of kalonji oil is beneficial in treatment of joint pain, back ache, and neck pain. Kalonji is found throughout the country. Kalonji is known by different names in different languages. In English, Kalonji is known as Samal Fennel, the Hindi name of Kalonji is Kalonji or Mangralia; Kalonji is known Mogrel in Bengali, and in Gujarati it is called Kalonji. In Malayalam, Kalonji’s name is Ell or Karum Jiragam and in Marathi, the black cumin is called Kale Til. How to make Kalonji Oil? Kalonji oil has innumerable health benefits. Kalonji oil can prepare by pressing Kalonji seeds with pressing machine. Before making oil from the seeds, it is suggested that seeds should be clean and be free from dirt and dust. Kalonji oil contains Glucoside, which is toxic in nature. Therefore, the use of Kalonji oil in large quantity should be avoided. It is also undesirable to use black seeds oil for a longer period of time. कलौजी तेलमे कॉफी मीक्स करणा लीखाहै वो कैसे है कॉफी पावडर कीतनी लेनी है सब मेथेड वताईये और ये ऑईल देशी दवाईकी दूकानमे मिलती है? Kalonji Oil is readily available in all chemist shops accross India. Take care and stay healthy! Can we apply kalonji oil in hair? Kalonji oil has a hoard of nutrients in it. Massaging the scalp with black seed oil, nourishes our hair and makes it healthy. As far as natural hair is concerned, black seed oil may help in regrowing certain thinning areas on the scalp too. Use Kalonji/ Black seed oil regularly and have a happy and healthy scalp. Kalonji oil available at all Indian grocers store. salam kareem. you should take a glass of warm water. add a tablespoon on pure honey then add some powdered cinnamon and mix. in the end add 1-2 small teaspoons of kalongi oil and mix again. drink this 20.mins before kbreakfast. also drink this before going to bed. stop eating 2-3 hrs before going to bed. How to use kalonji oil for eyesight improveness? Dear sir iam suffering form diabites , kindly help me out come out form this diabities. make a paste of bitter gourd with olive oil and put in a jar and keep it in a fridge and every morning on empty stomach eat one teaspoon of the paste that will reduce your blood sugar. Today i went to a pansar store and bought 1 kg black seed and grind it from a shop. I get 0.380gm from one kg black seed. Is there any body who know how to use this oil for eyesight improveness?? hi pls help me were I’m bought a kalonji oil becoz I dnt trust such a stores n shops may b they hv a doplicate material it any other way to buy a pure kalonji oil becoz I really impressed to kalonji oils benifits. Do the seeds have the same effect as the oil? How can I use them? Salam.is the any cure for vitiligo(safeed Daag)to use black cumin. Pls Prescribe the medicine for curing oily dandruff on scalp. The disease is known as Sebhoric Dtematitis in Allopathic medicine. Can you please advise whether kidney failure patient can consume kalonji oil. I only have about 25% kidney function left. I am not on any form of dialysis as yet. Thank you and greatly appreciate your reply. This is Amjad Hassan from Dubai, l have acute pain in knee, taking medicin but no benifit, can you advise for this treatment, , have joint pain also. How to use kalonji oil for nasal allergy? I have blackheads on my back. Will this oil help me? and if so how do I use it to cure this problem of mine. My relation is suffering from HIV. How do kalonji oil help. How to use? Can kalonji oil cure benign brain tumor? Thanks for sharing the benefits of kalongi oil. it is indeed extremely helpful. Dialysis process want to close of my patient, what would combination suggest with kalonji .